Happy Halloween! Who has big plans for the night? I recorded up to Part 11 last night and I am currently editing that one as we speak. Subsequently, I plan to upload all of the recordings tonight! I will warn you that the first 5 videos are kind of just rambling around and testing things out...We kind of get back in the swing of things in Part 6 where I introduce characters, take on their heroic challenges etc. I decided that instead of piling characters up into the same video I would take a different approach and keep things singular. This will allow everyone to find what they want to see easier (searching) and more efficiently (you only see that character etc). Granted, if you want to see it all you just have more videos to go through. I figured that some people would want to just see Shroomboom in action and wouldn't care to see Series 2 Chop Chop introduced since they are likely familiar with him. This new layout will definitely be more efficient. Halloween is one of my favorite holidays and I really enjoy it. The weather here will be perfect (feel for those of you on the eastern seaboard). I was able to record some Battle Mode in Giants yesterday and will try and edit it as well. My other plan for a Halloween gift for everyone is to record the unboxing of Fright Rider...I'm about to get on that. The "surprise" was going to be unboxing LightCore Hex. I ordered all the LightCore figures in from Toys'R'Us.com and the "old" characters shipped and arrived today (Drobot, Eruptor, Hex, Prism Break). The only catch is that I did not get Hex...they sent an extra Eruptor. All this despite the packing list clearly listing off Hex and the online receipts showing Hex was ordered and shipped. This is ridiculous. I really like Toys'R'Us, but their online ordering and shipping is ridiculous. Keep in mind I ordered these BEFORE launch day. I could have picked up the LightCore characters in-store, in-person on release day and at BOGO 40%. I ultimately did that when I saw how SLOW they were in shipping. I actually decided to cancel it, but there was no option to only cancel part of the order..it was all or nothing. As I sorted that out, I got an e-mail 4 had shipped...go figure. Anyway, my order from GameStop (which was placed Sunday morning) came to me Tuesday of that week. Toys'R'Us.com took a full 10 days since release to get to me...pretty sad. 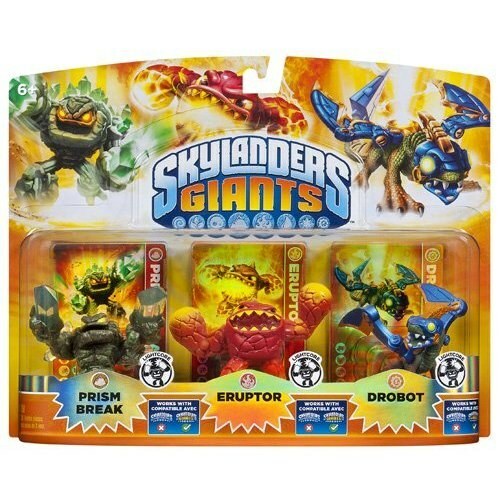 In store it is great (aside from the times they promote some huge Skylander event only to have 3-6 of the new character). As annoying as that is, I really do like buying from TRU because they have the best sales most of the time, better stock, and the employees will usually work with you. Their online ordering and shipping is just archaic. These LightCore, including my "Eruptor/Hex" will be going back. If you held out ordering in LightCores, or were looking for a better deal...this is it! This is a Target Triple Pack and includes LC Prism Break, LC Eruptor, and LC Drobot. It will save you a few bucks and will definitely be unique. As mentioned, I plan to do some more "blog only" hot links like that one...If you are reading this, you might note that the other recent addition was Granite Crusher who you can snag online from Target too. I will try to get both edited and uploaded tonight. Stay tuned for updates on the blog post archiving the blind playthrough too! Happy Halloween...stay safe and have fun!